(i) Unlike a transformer, the magnetic circuit of a 3-phase induction motor has an air gap. Therefore, the magnetizing current in a 3-phase induction motor is much larger than that of the transformer. For example, in an induction motor, it may be as high as 30-50 % of rated current whereas it is only 1-5% of rated current in a transformer. (ii) In an induction motor, there is an air gap and the stator and rotor windings are distributed along the periphery of the air gap rather than concentrated on a core as in a transformer. 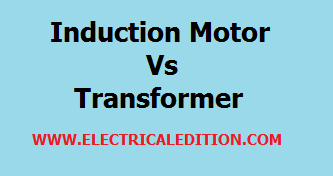 Therefore, the leakage reactances of stator and rotor windings are quite large compared to that of a transformer. (iii) In an induction motor, the inputs to the stator and rotor are electrical but the output from the rotor is mechanical. However, in a transformer, input as well as output is electrical. In the previous post we discussed construction of induction motor. 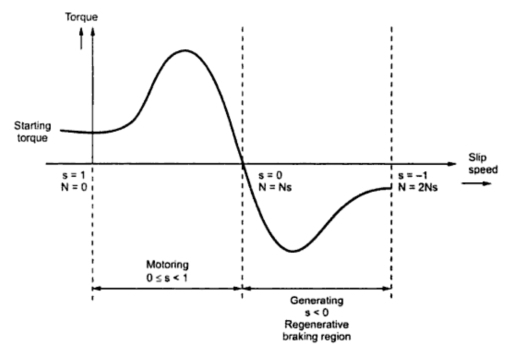 In this article we are going to discuss about "how induction motor works? ".Consider a portion of 3-phase induction motor as shown in Fig. The operation of the motor can be explained as under. (i) When 3-phase stator winding is energized from a 3-phase supply, a rotating magnetic field is set up which rotates round the stator at synchronous speed Ns (= 120 f/P). (ii) The rotating field passes through the air gap and cuts the rotor conductors, which as yet, are stationary. Due to the relative speed between the rotating flux and the stationary rotor, e.m.f.s are induced in the rotor conductors. 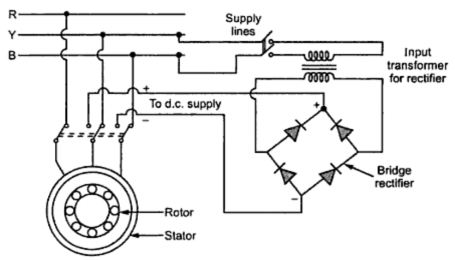 Since the rotor circuit is short-circuited, currents start flowing in the rotor conductors. (iii) The current-carrying rotor conductors are placed in the magnetic field produced by the stator. Consequently, mechanical force acts on the rotor conductors. The sum of the mechanical forces on all the rotor conductors produces a torque which tends to move the rotor in the same direction as the rotating field. (iv) The fact that rotor is urged to follow the stator field (i.e., rotor moves in the direction of stator field) can be explained by Lenz’s law. According to this law, the direction of rotor currents will be such that they tend to oppose the cause producing them. Now, the cause producing the rotor currents is the relative speed between the rotating field and the stationary rotor conductors. Hence to reduce this relative speed, the rotor starts running in the same direction as that of stator field and tries to catch it. We have seen above that rotor rapidly accelerates in the direction of rotating field. In practice, the rotor can never reach the speed of stator flux. If it did, there would be no relative speed between the stator field and rotor conductors, no induced rotor currents and, therefore, no torque to drive the rotor. The friction and windage would immediately cause the rotor to slow down. Hence, the rotor speed (N) is always less than the suitor field speed (Ns). 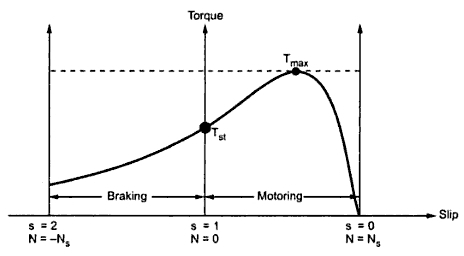 This difference in speed depends upon load on the motor. 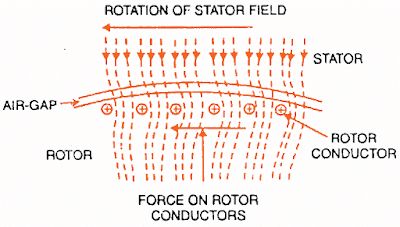 The difference between the synchronous speed Ns of the rotating stator field and the actual rotor speed N is called slip. It is usually expressed as a percentage of synchronous speed i.e. (i) The quantity Ns - N is sometimes called slip speed. (ii) When the rotor is stationary (i.e., N = 0), slip, s = 1 or 100 %. hardly 0.1% to 3% so that it is essentially a constant-speed motor. Tags:Working Principle of 3 phase Induction Motor,three phase induction motor working operation theory,types of induction motor induction motor working principle pdf. 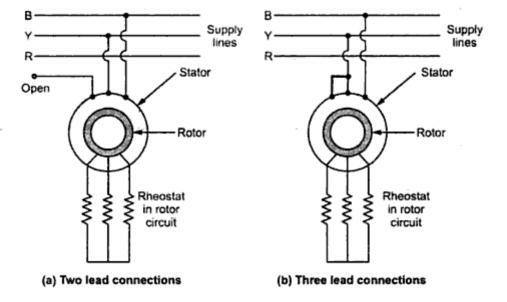 a) stator and b) rotor. 1.The stator of an induction motor is almost same as that of a synchronous motor or generator. 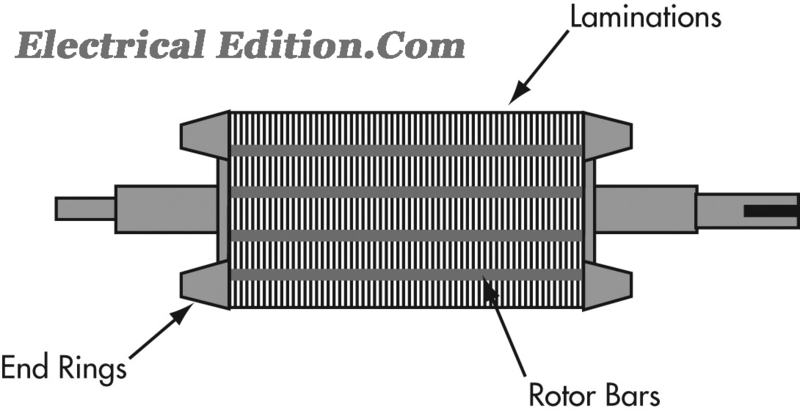 The main function of the stator core is to carry the alternating flux. 2.In order to reduce the eddy current loss, the stator core is laminated. These laminated types of structure are made up of stamping which is about 0.4 to 0.5 mm thick. It is made up of a number of stampings, which are slotted to receive the windings. 3.The stamping is generally made up of silicon steel, which helps to reduce the hysteresis loss occurring in motor. 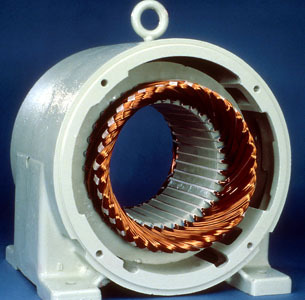 The stator of induction motor carries a 3-phase winding and that is fed from a 3-phase supply. 4.It is wound for a definite number of poles, the exact number of poles being detemined by the requirements of speed. Greater the number of poles, lesser the speed and vice versa. 5.When supplied to 3-phase windings, produce a magnetic flux, which is of constant magnitude but which revolves (or rotates) at synchronous speed (given by Ns=120f/P). This revolving magnetic flux also called as rotating magnetic field which induces an e.m.f. in the rotor by mutual induction. 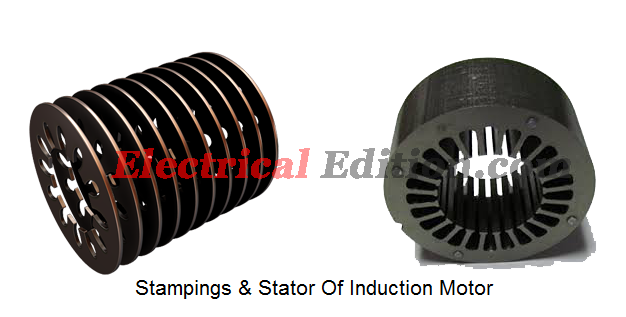 Induction motors are available with two types of rotors basically. i) Squirrel-cage rotor : Motors employing this type of rotor are known as squirrel-cage induction motors. ii)Phase-wound or wound rotor : Motors employing this type of rotor are variously known as 'phase-wound' motors or 'wound' motors or as 'slip-ring' motors. Almost 90 percent of induction motors arc squirrel-cage type, because this type of rotor has the simplest and most rugged construction imaginable and is almost indestructible. The rotor consists of a cylindrical laminated core with parallel slots for carrying the rotor conductors which, it should be noted clearly, are not wires but consist of heavy bars of copper, aluminium or alloys. One bar is placed in each slot, rather the bars are inserted from the end when semi-closed slots are used. The rotor bars are brazed or electrically welded or bolted to two heavy and stout short-circuiting end-rings, thus giving us. what is so picturesquely called, a squirrel-case construction (Fig.). It should be noted that the rotor bars are permanently short-circuited on themselves, hence it is not possible to add any external resistance in series with the rotor circuit for starting purposes. ii)it helps in reducing the locking tendency of the rotor i.e. the tendency of the rotor teeth to remain under the stator teeth due to direct magnetic attraction between the two. In small motors, another method of construction is used. It consists of placing the entire rotor core in a mould and casting all the bars and end-rings in one piece. The metal commonly used is an aluminium alloy. Another form of rotor consists of a solid cylinder of steel without any conductors or slots at all. The .motor operation depends upon the production of eddy currents in the steel rotor. Its construction is very simple and rugged. As there are no brushes and slip ring, these motors requires less maintenance. This type of rotor is provided with 3-phase, double-layer, distributed winding consisting of coils as used in alternators. The rotor is wound for as many poles as the number of stator poles and is always wound 3-phase even when the stator is wound two-phase. The three phases are starred internally. The other three winding terminal! 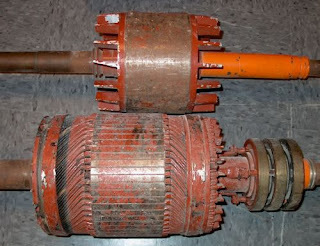 : arc brought out and connected to three insulated slip-rings mounted on the shaft with brushes resting on them. These three brushes arc further externally connected to a 3-phase star-connected rheostat. This makes possible the introduction of additional resistance in the rotor circuit during the starting period for increasing the starting torque of the motor, as shown in Fig. and for changing its speed-torque/current characteristics. When running under normal conditions, the slip-rings arc automatically short-circuited by means of a metal collar, which is pushed along the shaft and connects all the rings together. Next, the brushes are automatically lifted from the slip-rings to reduce the frictional losses and the wear and tear. Hence, it is seen that under normal running conditions, the wound rotor is short-circuited on itself just like the squirrel-case rotor. It has high starting torque and low starting current. Possibility of adding additional resistance to control speed. Slip ring induction motor are used where high starting torque is required i.e in hoists, cranes, elevator etc.